This story remains fascinating—and chilling—even after so much time has passed. I first presented this post in 2014. 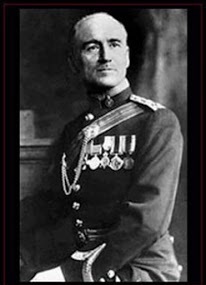 Over a century ago a British engineer, Col. John Patterson, wrote a book titled, The Man-Eaters of Tsavo and Other East African Adventures. A considerable portion of the book details his experiences in dealing with attacks by two enormous, man-eating lions that terrorized the builders of the Uganda Railway in and around the Kenya village of Tsavo. 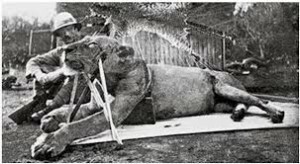 Patterson’s courage in the face of imminent death—by some accounts, the lions killed as many as 130 people during their nine-month reign of terror—makes for a fascinating read. In case you think this storyline sounds familiar, Patterson’s book became the basis for the 1996 movie, The Ghost and the Darkness. More on that shortly. Still, despite desertions by many laborers, work on the bridge went on, with occasional delays when the slaughter by the man-eaters peaked. Patterson, a skilled hunter, did everything he could to protect the workers and kill the lions, but with little luck. He built a large trap out of a railway car, which the lions ignored. Thorn fences, called bomas, encircled the camp, but the man-eaters either made their way through the wicked thorns or leaped over them and continued to kill their prey while they slept and drag them off. The Englishman spent many a sleepless night up in a tree, rifle poised, waiting for the lions to strike. But if they came at all, they raided a different part of the camp far from where he lay in wait. The carnage continued throughout the year, until at last, in December, Patterson managed to kill both of the lions. For the first, he set himself up as bait atop a wooden contrivance of four tall, inverted poles with a plank on top, a flimsy thing from where, after being stalked by the lion for a couple of hours, he managed to wound it. He then pursued it into the brush and shot it, but not until the next morning did he learn that the animal was dead. It took eight men to carry the carcass back into camp. Patterson with one of the man-eaters. Not long after, Patterson shot the second lion during a harrowing hunt in which the beast charged him a number of times. It took nine shots to bring the man-eater down, and it died tearing at a branch in its mouth. Patterson fulfilled his task of building the bridge over the Tsavo River, though other dangers challenged him along the way, all of which he details in subsequent chapters. The writing is a bit heavy-handed, and quite graphic in places. 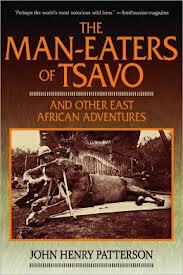 Still, The Man-Eaters of Tsavo and Other East African Adventures is a quick and easy read detailing a remarkable story. And a public domain edition is free on Kindle, if you can live without the photos that are included in other versions. A bit more accurate was the 1996 version, The Ghost and the Darkness. Val Kilmer portrayed Col. John Patterson, and many of the real Patterson’s experiences are portrayed. 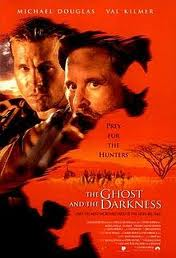 The greatest “fiction” in the story is that of “Great White Hunter” Charles Remington (Michael Douglas), who arrives with some Masai tribesmen to help hunt the lions. Still, a great deal of tension is achieved with the early conflict between the two men, which eventually morphs into respect. The graphic lion attacks are remarkable, and there are enough (fictional) subplots to keep viewers engaged. Footage of the African landscape is stunning (the filming took place in South Africa), and the Jerry Goldsmith soundtrack is one of the best ever. (I own it on CD.) The film was nominated for three Oscars and was awarded one for Best Sound Effects Editing. This is easily one of the forty or fifty films I include in my Top Ten. The skins of the Tsavo lions decorated Col. John Patterson’s floor for many years. A quarter-century after killing the man-eaters, he sold the skins to the Field Museum in Chicago. They were rather beat up when they arrived. The museum reconstructed the lions from the skins and from Patterson’s photos. 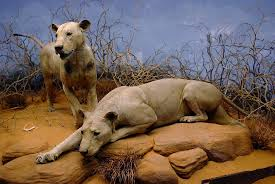 Along with the actual skulls, the Tsavo lions remain on permanent display there.